Pricefalls.com is an online retail marketplace, hosting thousands of retailers from across the United States. 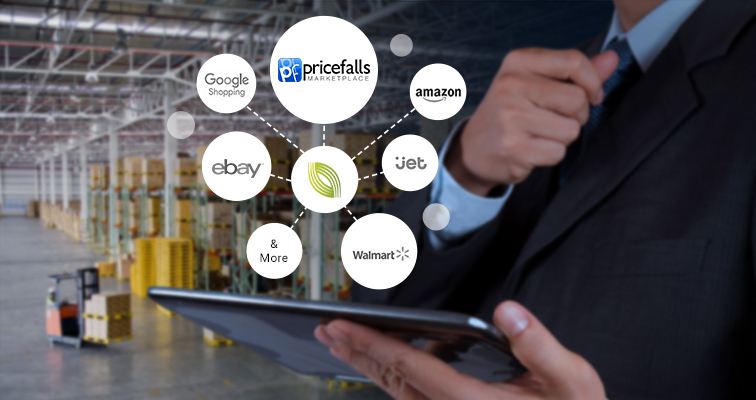 With millions of products, excellent customer service, and complete transparency, Pricefalls is redefining the marketplace model by connecting customers with retailers they can trust. Pricefalls is the only marketplace to share customer marketing rights with its Sellers, earning retailers more value with every sale. Pricefalls.com is an emerging marketplace with over 8m product listings and growing very quickly. This marketplace is fast becoming the destination that all sellers and buyers would want to be. At present, Pricefalls.com accommodates a vast range of products that spill over computers and electronics, home and garden, health and beauty and many more. Pricefalls.com Marketplace is counted among the platforms, which have everything it takes to attract and retain motivated shoppers for more. Ryan Rollo VP, Operations - Pricefalls LLC. ChannelSale is the unchallenged leader among all other providers of e commerce solutions, multi-channel marketing opportunities and more in the present decade. On approaching ChannelSale, you will be able to open up the doors of possibilities over 200+ marketplaces. ChannelSale offers you unquestionably the best integration process that can possibly be achieved in this evolved era of e commerce. With a wide range of intelligent tools and softwares made available by ChannelSale, you can achieve completely automated and literally flawless Pricefalls.com product listing and management that is sure to save wealth of time. Besides listing, our software also allows instant updating of listings while maintaining perfect compatibility with the requirements of Pricefalls.com. At the same time, you can also make the most of completely and infallibly automated real time Pricefalls.com inventory management, receiving performance reports and analytics, modification of product data and many more. ChannelSale ensures elimination of needless hassles in managing your day to day business while also eradicating the fears and worries that can surface with respect to inaccuracies and careless manual blunders. We also provide you with top-quality Pricefalls.com orders and shipping tracking management. If you are thinking how we go about the product listing process on Pricefalls.com, then this is the answer for you. We create the optimized listings on Pricefalls.com via your product feed file in formats like CSV, TXT, XLS or API-XML. Then we synchronize it with Pricefalls.com along-with the big names among the online marketplaces, comparison shopping engines and affiliate networks. ChannelSale can integrate your product data feed to automatically flow in to Pricefalls.com marketplace directly from your webstores such as Magento, BigCommerce, Volusion, Shopify, Yahoo store, AmeriCommerce, NetSuite, 3D Cart, Pinnacle cart amongst others. Pricefalls orders and shipping tracking updates can be synchronized with platforms such as Fulfilled by Amazon, SKU Vault, ShipWorks, ShipStation, StoneEdge, OrderMotion, OrderLogix, SOS Inventory and others. Granular level product category mappings pave the way for apt listing in sync with Pricefalls.com product category. Have variable pricing for Pricefalls.com and other marketplaces / shopping engines, or retrieve your Bonanaza.com pricing to be sent to other shopping engines or markup pricing over cost price. ChannelSale offers real time inventory services, for you to track product performance. For example - If a product sells on Amazon, eBay, Sears, Rakuten, Wish etc., the updated stock in hand would reflect in your ChannelSale account and further on Pricefalls.com. Centrally manage all Pricefalls.com orders and shipping tracking updates. Automate exporting Pricefalls.com orders to third party order fulfillment platforms / dropshipper’s, Fulfilled by Amazon, or to suppliers on an hourly basis. Setup to automatically retrieve order shipping tracking number on Pricefalls.com. When it is Pricefalls.com integration you are looking for, ChannelSale can offer you the best services that can make your multi-channel marketing program, a hit!